High Throughput SNP Genotyping involves assessing Single Nucleotide Polymorphisms (SNPs) in the DNA sequence of the genome being studied using microarray technology. SNPs are the simplest and most common type of polymorphism, occuring in approximately every 1000 base pairs. They are extremely useful in genotyping as they act as markers to track traits of interest. Human SNP genotyping is useful for linkage studies and association studies both in families and populations. There are multiple types of arrays available ranging from targeted to whole genome. Capacity is from several thousand to well over 1 million genotypes per day. The Illumina 500GX BeadStation Genotyping Platform has a unique approach to making assay-specific reagents and higher throughput with the benefit of low cost. In addition, no other high-throughput genotyping platform has achieved Illumina’s >99% accuracy. Microarray technologies can also be used to detect submicroscopic Copy Number Variations (CNVs) with high resolution. CNVs are small deletions or duplications that can be pathogenic for certain conditions. Most often, however, CNV’s are benign polymorphisms that may be associated with common diseases. 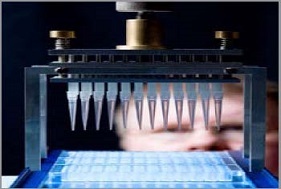 Microarrays are able to analyze the entire genome for changes in copy number in a single assay. Strategically selected probes provide sensitive CNV analysis and target high-value regions of the genome associated with disease. There are many different microarray platforms available with varying technical specifications and BCCGN can help steer you to the one that is most appropriate for your study. State-of-the-art facilities are available for detection of CNVs on Affymetrix GeneChips®, SMRT tiling path BAC arrays, BeadChips and Nimblegen and Agilent oligonucleotide arrays depending on the application involved, one particular CNV measurement platform may be more appropriate or cost effective than another. In some circumstances, looking for balanced structural variants (e.g. inversions) may be more appropriate and high throughput sequencing is available for this purpose.